Springtime in San Diego makes a colorful entrance every year as warm weather sweeps through the County and brilliant flowers bloom. There are also spring celebrations at the region’s major attractions and enough festivals, fairs and events to keep visitors entertained throughout the season. Be sure to get outdoors and enjoy the beautiful San Diego Spring weather! 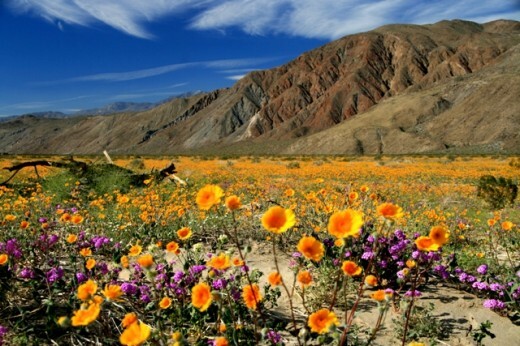 A spectacular display of color occurs annually between February and April in the 600,000-acre Anza-Borrego Desert State Park in San Diego’s East County as wildflowers bejewel the sun-scorched desert landscape. Guests are advised to call the Park’s 24-hour “Wildflower Hotline” at 760-767-4684 before planning a tour of the desert flora. At the Flower Fields of Carlsbad California, a vibrant sea of giant ranunculus flowers transforms 50 acres of hills into rows of brilliant color. During March through May, guests can stroll past oceans of flowers and through beautiful gardens, including a miniature rose garden, fragrant sweet pea maze, a garden featuring more than 50 All American Rose Selection winners and a spectacular display of red, white and blue flowers planted in the shape of a giant American flag. Balboa Park‘s Offshoot Tours provides free, one-hour tours that highlight the park’s lush botanical offerings; the tours begin at 10:00 am on Saturdays in front of the Balboa Park Visitors Center. Must-sees are the beautiful Inez Grant Parker Memorial Rose Garden, displaying approximately 2,500 roses of nearly 200 varieties, and the award-winning Alcazar Garden, with a floral design patterned after the gardens of Alcazar Castle in Seville, Spain. Guests can celebrate spring with Shamu and friends during Spring into Night at SeaWorld San Diego. During weekends in spring, exact dates TBA, visitors can laugh with sea lions Clyde and Seamore at the Sea Lions Tonite! nighttime show and be amazed at the visually stunning evening performance of Shamu Rocks before looking to the sky for a fantastic fireworks show. The San Diego Zoo Safari Park presents Butterfly Jungle, March 24 – April 15. During this four-week celebration, guests can walk through the Park’s Hidden Jungle, an African aviary, and surround themselves with thousands of butterflies of every shape, size and color. 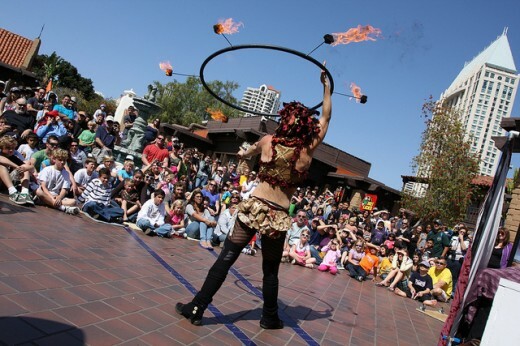 Seaport Village comes alive with a celebration of street performers during the Spring Busker Festival, March 24 – 25. In a battle of entertainment, extraordinary, one-of-a-kind performers including jugglers, sword swallowers, comedic stuntmen and Didgeridoo players take to Seaport Village’s cobblestone streets for a weekend of outdoor family amusement. The La Jolla Concours d’Elegance, sponsored by the La Jolla Historical Society, takes place April 1 in Scripps Park near La Jolla Cove and draws droves of classic car enthusiasts. The city of Fallbrook in San Diego’s North County celebrates its designation as “the avocado capital of the world” during the Annual Fallbrook Avocado Festival on April 15. Highlights include arts and crafts, games and creative foods featuring the delicious, green fruit. Tell us in the comments, what are you looking most forward to this spring in San Diego? This entry was posted in Arts & Culture, Attractions, Insider Tips, Outdoor Adventures, San Diego Events, Tours & Sightseeing and tagged anza-boreggo, balboa park, Carlsbad, downtown, east county, fallbrook, flower fields, north county, park, safari park, san diego zoo, seaport village, seaworld, wildflowers by Suzzanne. Bookmark the permalink. Wow this is exciting! I love to see all the events in San Diego. I’m sure lots of people will go there to experience Spring Busker festival. Who are the performers in that festival?